Browse the collections and use the virtual tours to learn more about the artworks' chronological and geographical connection to complex networks of cultural interchange. The Story of the Beautiful connects virtual tours of the Peacock Room to places and faces associated with its dynamic, cosmopolitan history, from its controversial creation in Victorian London by the expatriate American artists James McNeill Whistler (1834-1903) to its subsequent use as an aesthetic laboratory in Detroit by the Gilded Age collector and industrialist Charles Lang Freer (1854-1919), who founded of the Freer Gallery of Art—the first art museum of the Smithsonian Institution. Whistler and Freer both believed that the history of art—which Whistler called "the story of the beautiful"—transcended material and cultural contingencies and is always "already complete." Yet over the last 130 years, the Peacock Room has undergone a variety of geographical and stylistic incarnations to suit the changing tastes of its owners and audiences. Its history suggests that, far from being "already complete," stories of the beautiful are continuously revised and updated, shaped by points of contact that include individual biography; travel; the circulation of artistic objects; critical reception; social, commercial, and aesthetic networks, and encounters with art, both real and virtual. Alvin Langdon Coburn. 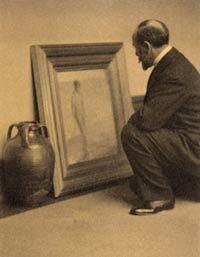 Charles Lang Freer Comparing Whistler's Venus Rising from the Sea to a Glazed Syrian Pot. 1909. Freer Papers.